Seventy-five years ago an unknown, novice aviator landed his second-hand de Haviland Gipsy Moth on a dusty airstrip in the far north of Western Australia, becoming the fourth person to fly from England to Australia. It was 4 November 1930, and, at 27 years old, Oscar Garden was the youngest and by far the most inexperienced. By Mary Garden. Mustangs, Yaks, Harriers and Cats. Compiled by Alex Mitchell. Simon Gault, Chris Bromley, and Rob Burns are three New Zealanders whose dreams know no limits. 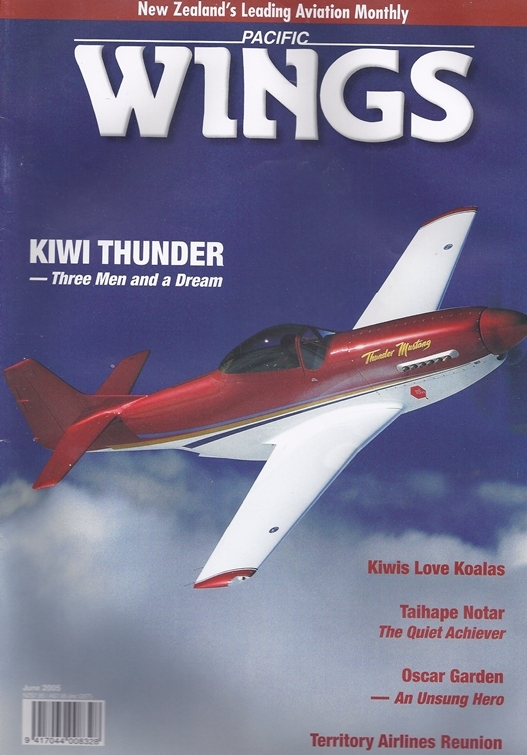 After surmounting the many obstacles in their way, the three have brought into New Zealand one of the most beautiful and rare aircraft in the world - the Thunder Mustang ZK-TMG. Rob Neil talks to the trio and gets a ride in this wonderful aircraft; fulfilling his own lifelong dream in the process. The heartland helicopter pilot is an iconic part of local New Zealand - a familiar combination of modern machinery and skill and knowledge. Mike Feeney takes a look at Taihape's veteran helicopter operators - the Goodwins - who have recently had their venerable Hughes 500 replaced with MD Helicopters' successor, the 520N NOTAR.